Trout Lily grows in huge colonies that can completely cover a forest floor. The colonies can be hundreds of years old and takes a long time to grow to such a size. Its bulbs are sterile up to about the seventh year and then it produces only one leaf and no flowers. When they mature one plant will grow two leaves and one, beautiful yellow flower. The colony spreads mostly by runners and less importantly by seed. Trout lilies have a symbiotic relationship with ants known as myrmecochory. This means that they exchange a lipid-rich appendage on their seeds in return for an ant seed dispersal that spreads the colony and protects the seeds from predation. This plant is a beautiful spring ephemeral meaning it is short-lived in the spring only. Distinguishing Features: Recognized by its brown-mottled leaves, this is a very common spring ephemeral wildflower and it is found in sizable colonies. Trout lily has no stem except for when it flowers then one flower appears per stem. This perennial herbaceous spring plant grows from a deep, ovoid bulb that can send up several single-leaved sterile offshoots along with the fertile plant. Nectar is produced at the base of the tepals, typical of plants in the family Liliaceae. Flowers: The flower blooms in early spring. The solitary, yellow, nodding flower has six petals. The flowers are hermaphrodite (have both male and female organs). Fields of Nutrition has medicinal benefits and vitamin/mineral content of Trout Lily. 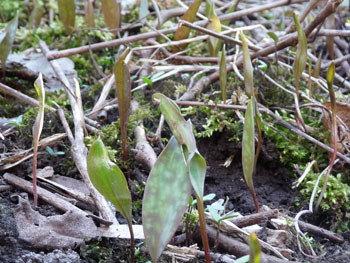 Leaves: Trout lily plants have only one leaf until it matures, then it has two. The leaves are stiff, waxy, upright, 7-20cm long. Trout lily leaves are mottled like a trout fish skin. The leaf stalk is red/brown. 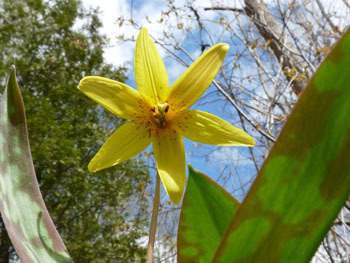 Habitat: Trout lilies only grow in forests in eastern Canada and the United States. The also grow in some forested areas in Europe and Asia. 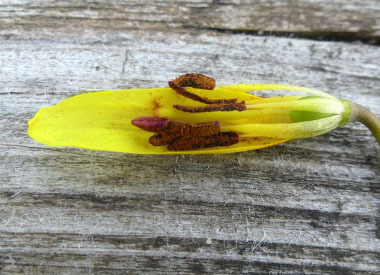 Edible parts: Trout Lily is both medicinal and edible. The leaves have a very mild flavour and the flowers have a slight sweetness due to their nectar and are also slightly acrid. The corms are edible as well and have a cucumber-like taste. Trout lilies are an emetic (makes you throw up), therefore it is recommended not to eat mass quantities of these in one day. You can add this plant to a salad or eat them as a trail snack. You can also make a tea with the flower, leaves or corm (or all). Collect enough corms then they can be roasted. Other name: Dog Toothed Violet. Similar plants: White Trout Lily.